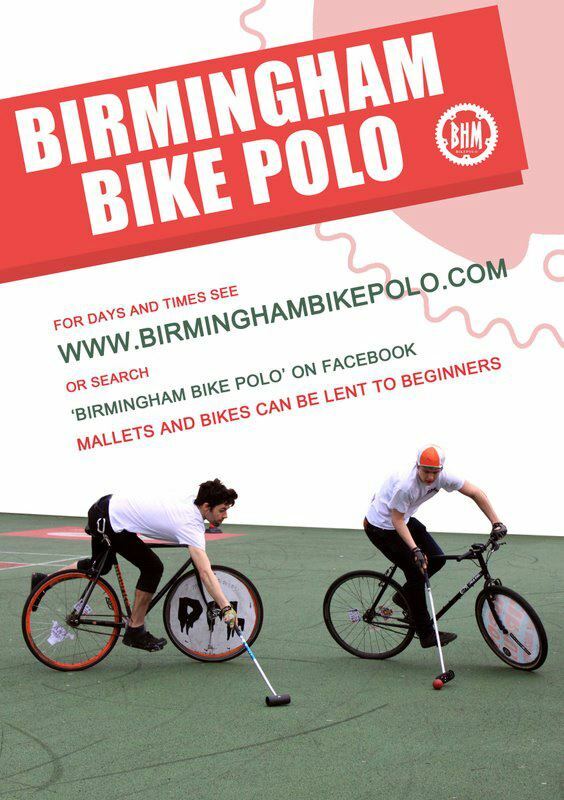 Beginners Day Sunday 8th April | Birmingham Hardcourt Bike Polo, UK. A few of us have been playing for three years now, and although we’ve more than doubled our turnouts in that time, we’d still like more people to play! We’ve been telling anyone who’ll listen about how fun polo is for ages, and every now and then we get an influx of new players. We do our best to encourage them and build their confidence quickly, but it can be a bit daunting when you’re playing with experienced players. With that in mind, we’re holding a beginner’s day on Sunday 8th April, at 1pm, Highgate Park. We’ll be playing from 10am, so if you want to watch a few games before getting stuck in, you’re more than welcome. It’ll be a social affair, so bring food and drink if you want to hang out. All ages are welcome, but if you’re a minor you should bring a parent. If you’re a woman and think it all looks a bit testosterone-heavy, fear not, as we have several female players who will be on hand to offer advice and encouragement. We’ll lend you bikes and mallets, but if you want to feel safer then maybe bring a helmet, gloves and pads. We hardly ever have any injuries worse than cuts and bruises, but you’re responsible for your own safety! We expect to be playing for a few hours. The idea is that we’ll explain the basic rules, give you a bit of training/practice, and then get you playing in games with fellow first-timers.